Steph Lew is a freelance Concept Artist based in San Francisco who’s worked for a number of top game companies including Disney, Interactive, and EA. Basically, she is crazy talented, and one quick look at her Instagram account totally solidifies this! 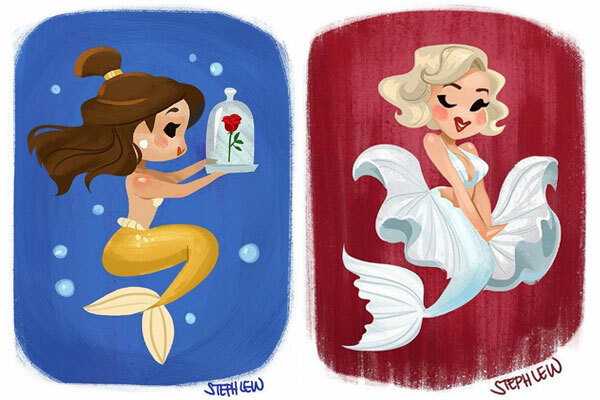 Lew recently shared a number of illustrations re-imagining popular characters (as well as creating original characters) as mermaids, and they are insanely gorgeous. …and the centaurs from Fantasia. There’s even a Princess Leia. The series goes beyond Disney, too, like this Black Lady from Sailor Moon. And this super sweet Marilyn Monroe. But it gets even better when Lew reimagines real sea life like this anglerfish mermaid. But which one is your favorite? Frankly, we can’t decide!